The White House on Monday drop President Obama's up and coming meeting with Philippines President Rodrigo Duterte. This comes after Duterte lashed out at Obama for swimming into the issue of the Philippines' pioneer's disputable arrangement toward street pharmacists. Obama and Duterte had been set to meet in Laos this week, where Obama is going to a meeting of Southeast Asian pioneers. 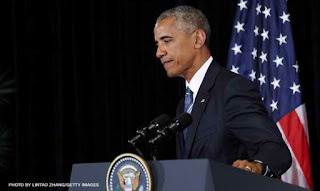 White House authorities already said Obama would go up against the Philippines President about his nation's treatment of street pharmacists, including additional legal killings, or government executions without the advantage of legal procedures or due process. However, the Filipino pioneer did not warmly embrace that thought, saying Obama would be wise to mull over raising the issue of the killings. "Who does he think he is? I am no American manikin. I am the president of a sovereign nation and I am not responsible to anybody with the exception of the Filipino individuals," Duterte jeered in a discourse Monday. "Child of a b****, I will swear at you." Obama rather will meet on Tuesday with President Park Geun-hye of South Korea. Duterte went ahead to accuse the U.S. for bringing on the distress on the southern Philippines Island of Mindanao. "In actuality, we acquired this issue from the United States," he said. "Why? Since they attacked this nation and made us their oppressed individuals. Everyone has an unpleasant record of additional legal executing. Why make an issue about battling wrongdoing?" He included: "Take a gander at the human privileges of America along that line. The way they treat the transients there." Accordingly, Obama proposed prior Monday his arranged meeting with Duterte may not go ahead. "I generally need to ensure in case I'm having a meeting that it's profitable and we're completing something," Obama said amid his news gathering. "On the off chance that and when we have a meeting, this is something that will be raised," Obama said, alluding to the Philippines' questionable record of battling medication wrongdoing since Duterte took office recently. Since Duterte was chosen, more than 1,900 individuals have kicked the bucket, incorporating no less than 700 in police operations that were a piece of the president's hardline war on medications. "Try harder. Triple them, if need be. We won't stop until the last medication ruler, the last agent, and the last pusher have surrendered or put in jail – or underneath the ground, on the off chance that they so wish," Duterte said amid his State of the Nation discourse on July 25. In spite of the bullish tone, an administration representative demands that the Duterte organization is against any type of additional legal killings. "We don't support these demonstrations," Presidential Communications Office Secretary Martin Andanar said. "(The) legislature is here to spare our kin from the medication hazard and rebuff the wrongdoers, including the hotshot ones. The PNP (Philippine National Police) keeps on exploring circumstances including vigilante killings and operational perspectives where passings are accounted for."